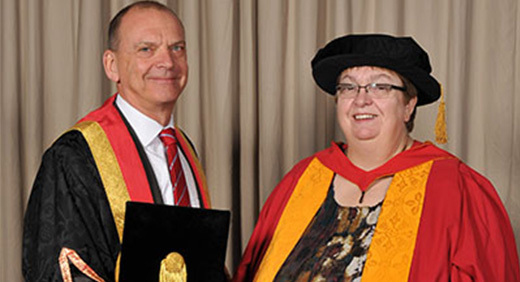 Professor Elizabeth Hughes has been presented with an Honorary Degree of Doctor of Science from the Faculty of Education, Health and Wellbeing in recognition of her significant contribution to the medical industry. She is Director of Education and Quality at Health Education West Midlands and Regional Postgraduate Medical Dean responsible for the training of junior doctors, dentists, and non-medical healthcare professionals throughout the West Midlands region. She has been involved with education and training for many years in the West Midlands across many healthcare professions. In addition she has roles nationally in the training of specialists in many areas of medicine, as well as her work in developing innovative healthcare roles regionally to support high quality patient care. She is consultant in chemical pathology and metabolic medicine at Sandwell General Hospital, West Bromwich; honorary professor at the University of Birmingham; and is a national expert in the treatment of inherited lipid disorders – being a founder member of the national charity HEARTUK. Professor Hughes is Director of the Sandwell Medical Research Unit, a leading UK centre for research into diabetes and heart disease particularly focusing on research on cardiovascular risk in the South Asian Community on which she has published widely. Part of the work of her group has also been to pioneer cardiovascular screening in hard to reach groups utilizing innovative community programmes, contributing to reduction of health inequalities in this area. She was presented with her honorary award at a graduation ceremony at Wolverhampton Grand Theatre on Tuesday September 9. For media enquiries please contact Emma Pugh in the Media Relations Office on 01902 322736.